Two words, friends: Faux Tatoes. When we discovered the amazingness that is, mashed cauliflower...our lives were forever changed. I'll admit, at first, it sounded quite unappealing to me. In fact, years ago my husband and I both despised the veggie! But let me assure you- it's absolutely the opposite now! 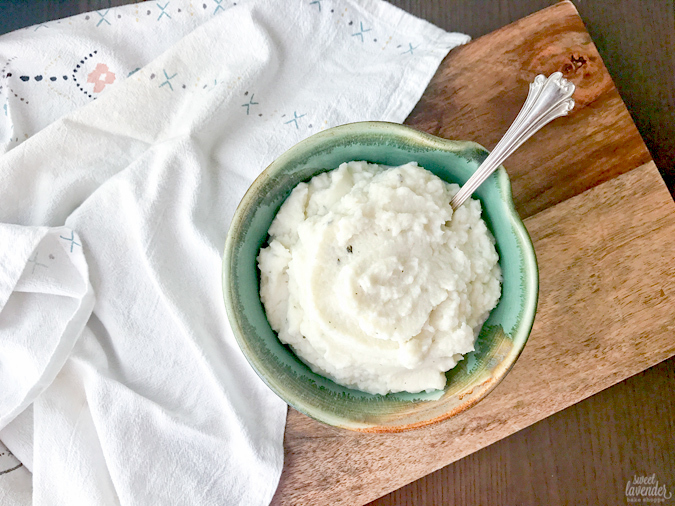 We can't get enough of this mashed potato alternative. I'm going to be honest with you- since going paleo a little over a year ago, I've missed mashed potatoes. Buttery, salty, fluffy mashed potatoes. My husband, who is 50% Norwegian (meaning about 75% of his diet consisted of white starchy potatoey yum yums) misses mashed potatoes even more! So when I saw people making the stuff I was quick to hop on that train. My poor husband...he was a tad slower to join us on the mashed cauliflower train to Delicious-Ville, but rest assured friends, he's there now! We love this side dish and make it once every week or two! I've played around a whole bunch with this recipe, adding and subtracting this and that, and think I've finally found a version we just adore. 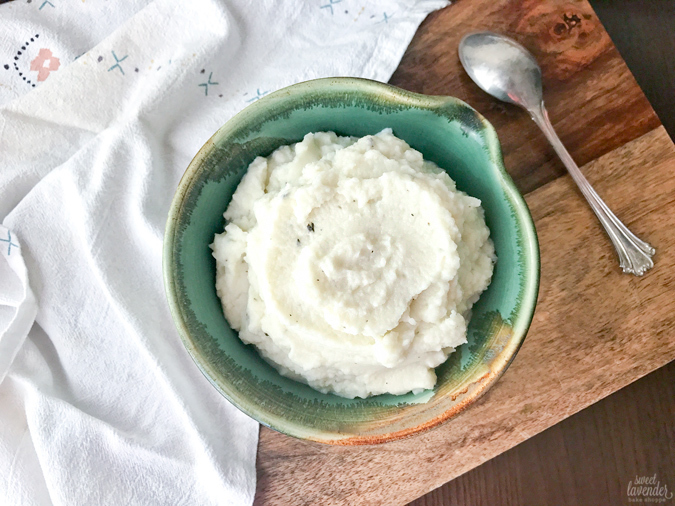 So glad to finally have our very own version of mashed cauliflower (or what we call, faux-tatoes) for you all to enjoy! 1. Steam cauliflower and onion chunks over a pot of simmering water until cauliflower is fork tender, about 15 minutes. We use this steamer basket placed over a pot of about an inch or so of water. Do not submerge veggies in water, as that will make the finished product very loose and wet. 2. Once veggies are cooked, quickly add to a food processor and puree for about 30 seconds. Stop and scrape down sides and puree again for about another 30 seconds. 3. Next add the coconut butter, coconut oil, salt, thyme and onion powder and puree until smooth. Finally add coconut milk (up to a tablespoon) until smooth and creamy. Serve immediately. Tastes AMAZING served along side our easy veggie filled paleo meatballs. Veggies on veggies!